Hot Seats on sale in summer | What Car? Seat has revealed two exciting new hot-hatch models that will go on sale this summer. 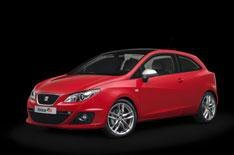 The Ibiza FR has a 1.4-litre petrol engine that's both turbocharged and supercharged to deliver a beefy 148bhp. A seven-speed DSG semi-automatic gearbox with steering wheel-mounted gearshift paddles comes as standard. On the outside there are bespoke bumpers, with black inserts and an FR logo at the front and a black diffuser section at the rear. There are also unique alloy wheels, silver-coloured door mirrors and twin exhaust tailpipes. Inside, there's a new instrument display and steering wheel both featuring the FR logo and sportier seats. A long list of standard equipment includes stability and cruise control and cornering foglights. The latest Leon Cupra follows the lead of the face-lifted Leon range, with tweaked interior and exterior styling. The new front bumper has vents below a honeycomb central grille, black inserts and a prominent Cupra logo. As with the rest of the Leon line-up, the Cupra has upgraded air-conditioning and stereo controls, while the chunky sports seats are now available in black leather with white cross-stitching as an option. As before, the Leon has a 237bhp 2.0-litre turbocharged petrol engine that produces a top speed of 153mph and an official 0-62mph time of 6.4 seconds. The new Leon Cupra goes on sale in July, while the Ibiza FR will be available from September. Prices will be announced closer to on-sale dates.